Carry the essence of love in 7 languages when you wear this Asian-style Power of Love sterling silver pendant. 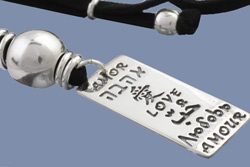 This inspirational piece of jewelry has the word love written in Spanish, Hebrew, Chinese, English, Arabic, Russian and French. Wearing this sterling silver love pendant will become a daily ritual for holding thoughts of love for all of humanity. The .925 sterling silver love pendant measures 5/8”wide x 3” long including the top bead and comes with an adjustable 16” to 24” black suede cord.